Reservations are required for all days of operation by telephone only. Shady Gables is very busy and proud to be of service to such wonderful guests! Please call now to reserve your table. We look forward to being of service to you! We are dedicated to serving the most enjoyable afternoon tea meals for miles around. We bake all of our scrumptious scones and delectable desserts fresh daily. We import our clotted cream and lemon curd from England. Each guest receives a perfect pot of tea, expertly brewed to order and delivered to the table dressed in a demure tea cozy and poured by a friendly, knowledgeable, and attentive server. Most of our guests like to spend at least two hours savoring their tea meal. Why does it take so long? Because most guests just don't want to leave! includes the meal, tax and gratitude! the $15.00 per person includes the meal, tax and gratitude! *Imported Devonshire Clotted Cream from England is also available for purchase. Meal prices do not include tax and gratuity. Prices are subject to change without notice. No splitting of meals please. City ordinances prohibit alcoholic beverages on our premises because we are located within 100 yards of a church. Due to Health Department Regulations you may NOT consume food or beverages at Shady Gables that were not purchased here. This includes Birthday Cakes. Special diets may be accommodated with advanced notice when possible. 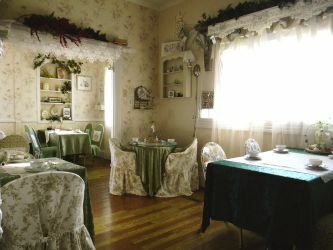 Shady Gables is a Traditional English-style afternoon tea room. Sorry, we are not a sandwich or coffee shop. Our meals are served afternoon tea style, NOT a la carte style. Individual sandwiches are available for take-out only with advance notice. Seating is reserved ONLY for patrons who purchase a meal. Due to limited space, we cannot provide seating for non-paying customers. Thank you! Allow us to help you with your bridal shower, birthday party, retirement party, baby shower, graduation party, and bridal teas. Whatever the special occasion, we are glad to help. Ask us to prepare your party favors and have them placed on your table with your guests names, all for a small additional fee. Reservations are Required by telephone only. Please call now: 573-378-2740. OPEN: Thursdays, Fridays, & Saturdays from 10:00 am to 4:00 pm. for the Gift Shoppe! Typically Tea Room reservations are taken between the hours of 11:00 am to 1: 00 pm with the tea room/kitchen closing at 3:00 pm!